"Nigel was ill so it was just me and Will who set out at 6:30 on Sunday morning to get out of London. We arrived at the course early so decided to drive round the sections we had not seen before (Will has ridden in the area before so knew some of it). We noted some nasty potholes, and the small hill which looked like it would be the scene for attacks. Steve had also warned us that this was usually the case on this course. There was a large field of 80 3rd and 4th cat riders and we assembled at the start point to do essentially 3 laps of the 15 mile circuit. A prime was up for grabs at the end of the 2nd lap but we decided not to try and contest it and to save ourselves for the finish. We formed up in the large bunch with some trepidation. It was only my second race on the open road and I took a pounding the other time (my fault for entering an E1234 race). It was Will's first race on the road and he looked a little nervous too. The bunch was led out by the car through a 1 mile neutral zone that then pulled away leaving the racing to get going. Will and I stayed mid bunch for the first lap. The weather was warm, dry and not windy. People tried to attack off the front and were continually reeled in. This led to some dramatic surging in the bunch, maybe this is a normal feature of road racing! No one was getting away, but the pace stayed high, talking to Will after one lap we both agreed we weren't feeling to great! The pace seemed to ease a little for the first half of the second lap but soon ramped up again towards the end as people tried to pull out a lead for the Prime. I have no idea who won the prime but I took the opportunity in the lull in action after the prime, at the start of the final lap, to move up towards the front of the field. My legs seemed to be coming back to life ( too much sprinting at Calshot the day before I think!) by this stage and I started to feel better up the front. I stayed in the top 20 round the circuit but didn't do any work. I don't think I made any friends!! 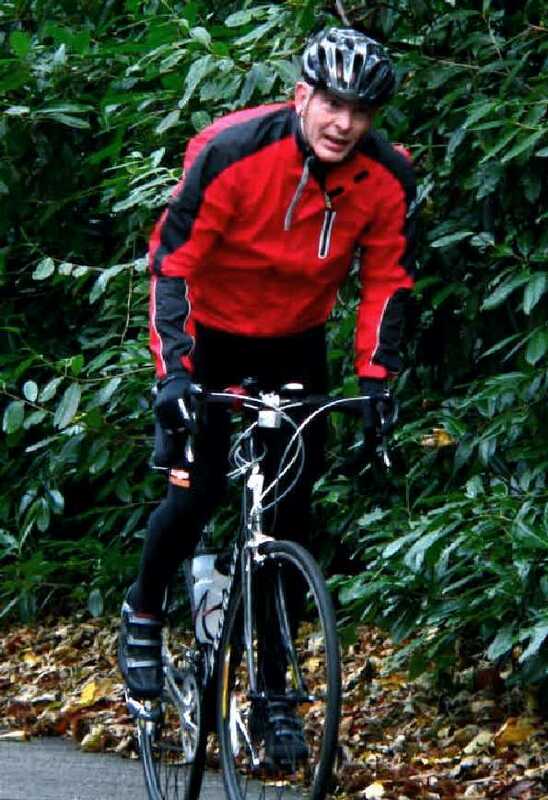 There were 2 High Wycombe riders who got cross with me, and another rider from an unknown club too. I ignored them and did the selfish thing of pulling back any time I got near the top 3! As we approached the hill an Evans Cycles rider (who I have seen at many of the races I have done) jumped off the front. He always seems to have a dig on the hills. I managed to resist the bait of going too and stayed towards the back of the top 10. He quickly got caught. I was starting to feel more confident at this stage as despite my normal slowness on hills (which I even noticed in the previous laps!!!) this time round I found myself having to ease off to stay where I was in 8th or 9th place. Coming over the top of the hill the eventual winner apparently jumped off. I must have been daydreaming as I never even noticed him go away, though maybe it was for the best as I would only have been tempted to go with him! I stayed up front for the descent, and got round the fast final big left turn without incident. That left about 4 or 5 miles of flattish road, followed by a drag up to the finish. I stayed right up front, just behind two High Wycombe riders and the Evans cycles rider who had tried to go on the hill. They pushed the pace and I hang in, making sure I didn't do any work. The High Wycombe guys took the time out to ask me to help but I just avoided eye contact! Coming up to the final drag riders started to push through past us but for the first time I managed to hold my nerve and wait. The High Wycombe guys died as we came to the top of the drag. There was about 300 or so metres of flat road to the finish. It was about here that I noticed the eventual winner out in front... too late to catch him....oops. There were a few riders around me, and others starting to come through. I remember jumping onto the wheel of a big Reading CC rider who came past me, then jumping off him as he slowed onto the wheel of a big guy in blue and black (not club kit). This kind gent gave me a few more metres of shelter then as he slowed i went for the line, to my far left an Oxford rider jumped clear. Immediately to my left was a London Dynamo rider, and to my right was a Cambridge rider. The Oxford rider went slightly earlier than us 3 and it paid off as he came in 2nd. To my right the Cambridge rider took half a wheel, and then a bike length (clearly I need to do more squats), but too my left I was thrilled to see the Dynamo rider slipping back back behind me. For a few glorious seconds me and the Cambridge rider were alone. Then he beat me!!! I stopped by the road and waited for Will as he piled through with the rest of the bunch just behind us. He was pleased to have come in in the top half of the bunch in a race with only 10 other 4th cats in it. It won't be long till he gets the points he deserves to be a 3rd. It was great to see Dave's beaming face after the finish. The miles he must put in coming to watch races!!! Crazy!" Well Done to Kevin Bird for completing this year's Ronde van Vlaanderen 140k route in 8h10, which features the infamous cobbled Koppenberg climb. "Hi all, I just returned from the Tour de Flanders. Great fun and highly challenging. I posted a video on You Tube if anyone wants to see what its like. 17000+ cyclists took part 140km and 1800 meters of climbing. Nearly all the climbs were on large cobbles and very narrow lanes. Never seen so many seriously injured people in my life!" 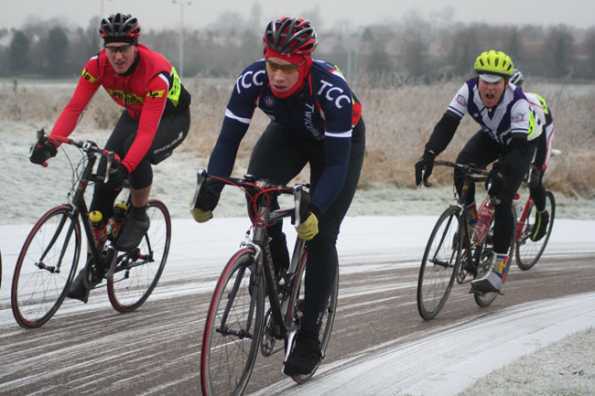 Another well supported Track Training Day organised by Coach Mac saw 20 TCC members take to the boards for a fun day out.